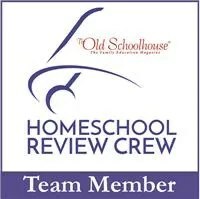 As part of the TOS Blog Cruise earlier this month, we talked about setting goals for our homeschool. This time, our topic is “What does lesson planning look like in your homeschool?”. As I’ve mentioned before, I am a planner by nature, and I like having a written plan for the week to follow. Of course, that doesn’t mean we always follow my plan exactly, or that we always get everything done, but I like to think of my plans as a “working guide” of what I would like to accomplish each week. So, how does this look for me? Well first, I start using planning pages from the TOS Homeschool Planner, and Donna Young’s website (which is free). I use one planning page (the Loved Edwardian Planner) for each of my children for our individual subjects, then a different page (the A-Row Planner) for the subjects we do together. I also like the Week-at-a-glance page from the TOS planner, which lets me record activities, our weekly menu etc. etc. Usually I set a few hours aside during the weekend (Fri.-Sun.) to plan depending on my husband’s work schedule. (He is a firefighter, so he works 24/48 hour shifts…I usually try to save my planning for a night he’s at work so I can spend time with him when he’s home 🙂 ). At the start of the year, planning can take me a couple of hours, but as the year goes on and we get into a groove, it doesn’t take as long. At the end of each week, I highlight anything we didn’t get done, so I can move it to the next week! I also love sticky notes!! 🙂 I keep a pad of them in my pocket at all times so I can make notes while we homeschool about things I think we need to add for the next week (i.e., review simplifying fractions). I put my stickies from each day in my planning binder and review them when I am planning for the next week. “Reading is a conversation between a reader and an author.” This is a quote from the introduction to the Excellence in Literature reading program and I LOVE IT! As a reading teacher, I have always thought of reading as exactly that, and I am happy to find a reading program that supports this point of view! You may be familiar with the IEW writing programs, but Excellence in Literature is a program aimed at helping kids to read and analyze literature. There is writing involved, but the main focus is reading! It is aimed at grades 8-12, and I will say, I consider it an advanced program. It digs deeper into the reading than other programs I have used. The progam has both regular and honors options, (depending on which books you choose), and uses classic literature books and short stories, which you may (or may not) be familiar with. I already had a few of the books used in the program (Treasure Island, Jane Eyre, Animal Farm) but many of the books are available at your library or on the internet. The program is designed to be self-directed, with week by week lesson plans. However, it could DEFINITELY be considered a college-prep program, and my 8th grade son, who used the Introduction to Literature program, needed a lot of support with this program at first. Not so much with the reading, but with the analyzing and writing parts of the program. So many times I have seen students “read” a book, and yes, they get the “gist” of what’s going on, and can even put together a good summary of the book, but, when you dig deeper and ask them questions that cause them to think CRITICALLY about what they have read, they just don’t get it! The first unit starts off with short stories. Links for the stories were included, although some of them did not work. I was able to find most of the stories online however, so it wasn’t too much of a problem. My son had to write a compare and contrast essay for the short stories, and that wasn’t too much of a problem, as he had already done essays like that before. The second unit involved reading Around the World in 80 Days by Jules Verne (or 20,000 Leagues Under the Sea if you wanted to pursue the honors option). My son enjoyed this book, and the manual includes background info on the author as well as links to include poetry by Jules Verne, music related to books of his that have been made into movies, visual images etc. etc. The manual instructed students to read the novel over a two-week time period, but we took a little longer to finish it! 🙂 My son had to write an author profile, which he didn’t have too much trouble with. The program gives you resources to find out more about the author, so that part wasn’t hard. However,when he was asked to write an essay responding to a specific question about the story, and to include specific examples from the story to support his opinion, that was a little more difficult. Since this was the first time he’d done this, we started with a discussion of his answer to the question, then together we brainstormed examples from the story to support his answer. I have to say, this was the best literary discussion we have ever had!! He is currently reading A Connecticut Yankee in King Arthur’s Court and we are working through those assignments together as well. I have to admit, I am not a huge fan of Mark Twain, but this is a book I actually liked. The Introduction to Literature includes eight units in all, and I suspect my son will need less and less support from me as time goes on. If we do the second part of the program next year (English II: Literature and Compostion), I think he will probably be okay to do the progam by himself with me available to answer questions as they come up. 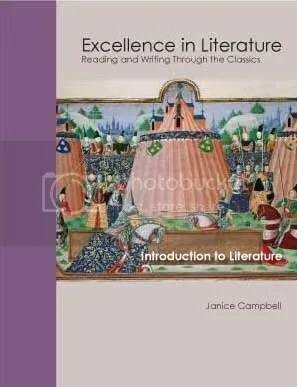 Excellence in Literature includes English I, English II, American Lit, British Lit, and World Lit. I have looked at the upcoming programs and I think they look amazing! 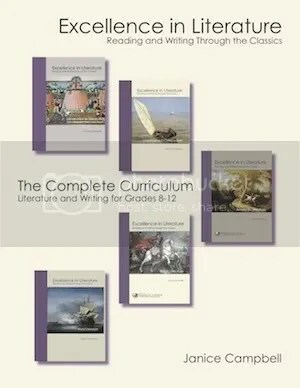 The selection of books alone is fantastic, and the manual comes with great instructions and clear examples of the types of papers students are expected to write. **Disclaimer: I received this program free of charge for the purpose of writing this review. All opinions expressed are my own. Northstar games designs “games with personality”. They are the creators of Say Anything and Wits and Wagers (which we got to play for this review). The company was founded by Dominic Crapuchettes, who designed his first game when he was in 8th grade! 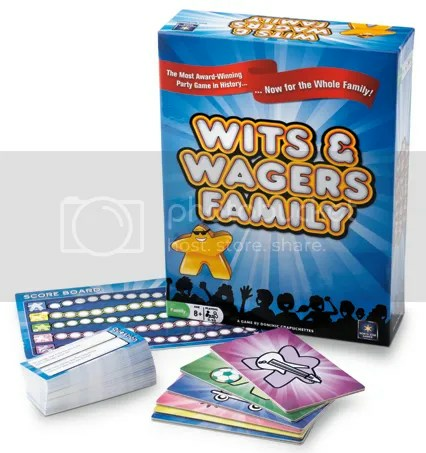 Wits and Wagers comes in two versions: the family version and the party version. The party version is for 10 or more players, while the family version can be played with 3 to 10 people, or even in teams. My husband and I and our two boys really enjoyed this game! The game consists of a game board, questions and “meeples” which you use to keep track of your answers,and answer boards where you write down your guesses. The first player chooses a card and asks a random (I mean really random 🙂 ) question…it may be something like “what percent of U.S. households have at least 1 pet cat?”. Then each player, or team, writes their best guess on their answer board. The answer boards are placed on the table, and each player places their meeple on what they believe to be the closest correct answer (you don’t have to choose your own answer). You can even split your meeples in between two answers if you want to! Points are awarded for choosing the closest guess without going over! We had so much fun playing this game together. The questions themselves are so unusual, they produce a laugh when you’re asking them. My boys really enjoyed trying to figure out what the best answer may be…and they were excited when they were able to get close. A lot of times, we forgot to even keep track of the score. There are a total of 150 questions in the game, allowing for plenty of time to play. At our house, we try to enjoy a family game night at least twice a month, and we are always looking for new games to add to these nights. Wits and Wagers family is quickly becoming a favorite, and our boys even get it out when they have friends over (and my husband and I have played with friends as well…so it’s fun for adults and kids!). I am currently considering buying the party version for our housewarming next month. I did not get to play Say Anything, but I have heard good things about that as well. Wits and Wagers family costs $15.23 at amazon.com, and it is definitely worth it! (It is also available at some Target and Barnes and Noble stores..at least in my area). 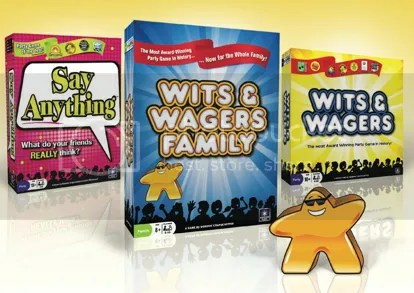 If you love trivia games that will provide you with endless laughter, Wits and Wagers is a great choice! **Disclaimer: I received a free copy of this game for the purpose of writing this review. All opinions expressed are my own. The general question is “What does this time of year mean to you?”. For me, the answer starts with memories. As a child, I remember spending Thanksgiving in North Carolina with my grandparents…that was really the only time I got to see what people meant when they talked about the leaves changing colors!! (around here, the palm trees only go from green to brown!). I remember thinking how beautiful the mountains looked with all those pretty reds and yellows! To this day, I download fall pictures on my computer to use as wallpaper, to remind me of that time. Fall is actually the start of my favorite time of year! I am a holiday girl, through and through. I love ALL of them…Halloween, Thanksgiving, Christmas. I love the anticipation of getting ready for each special day. I love the smells of the food, the laughter with friends, even the holiday dinners spent at the fire station! (We have a lot of those). To me, fall is caramel apples, pumpkin bread, turkey, apple cider, evenings around the fire pit roasting marshmallows…and just memories I can build with my own family, like those I treasure from my childhood! What does fall mean to you? To see what it means to other crew members, click on the blog hop link in the sidebar! And Happy Fall to all of you! It’s going to cost HOW MUCH?!! Our topic for the homeschool blog cruise this week is homeschool budgets. Do you set a specific budget for homeschool supplies and books? Do you just wing it and pay as you go? I do a little of both. As far as curriculum goes, I do have a budget. Currently, my budget runs about $1200 per year for two kids, although I expect that will go up as my oldest enters high school next year. Yes, I know that is a lot, and there are a LOT of people who homeschool for less, or free. I have a hard time spending hours searching for freebies and stuff like that. I do buy used whenever I can, and I utilize our library a LOT, but when it comes to curriculum, our budget is pretty generous (about $600 per child). I would say I spend the most money on science, history and reading. We use a combination of lit-based history programs (Winter Promise, Time Travelers, and Notgrass). When possible, I buy the guides and exclusives from the company, and then fill the rest in with library books. We use a mix of things for science. This year we are studying the human body and forensic science, and I did splurge on items for experiments and things like that, because my boys love it!! I don’t have a problem with spending more, if I know it’s something they will really enjoy. We use a combination of textbooks/workbooks for most other subjects, and I buy used whenever I can. I also like to use inexpensive curriculum for some basic subjects, like CLE for math and ACE for grammar. I find these curriculums are very thorough, and I think they are a good buy for our money! My older son is using Lial’s pre-algebra this year, with the DVD’s, because I just don’t feel comfortable teaching the upper level maths. For me, I will spend extra on higher math and science to have a DVD that I can also use with my younger son, because I just want to make sure they don’t miss anything!! I hit the dollar store for basic school supplies, but I do buy the more expensive colored pencils, because my boys like those better. Also included in my budget are the classes my boys take at our homeschool group every year. This year my oldest is learning computer programming and working on a video yearbook, while my youngest is doing classes on Missionary Geography and Contenders of the faith. So, living on one income (and a fireman’s income at that!) how do we pay for all this? Well, I am fortunate that my husband is an excellent budgeter. He saves a little each month to give me the money I need to buy curriculum each May. We also skip cable TV, fancy cell phones, eating out and things like that…and I coupon a lot to save money on groceries. We are fortunate to live in Florida, where the weather is temperate and we have access to plenty of beaches, parks and other free (or very inexpensive) outdoor entertainment! We also have a really good library system in our county, which doesn’t cost anything and lets me check out as many books as I want at one time, and gives me access to hundreds of books through ILL. The great thing about homeschooling is that there are so many ways to do it! If you are great at finding deals and freebies, you can homeschool on a really tight budget. We likely spend more on curriculum than a lot of people do, but that’s what works for us…and since we decide how we homeschool, that’s all that matters! E-mealz is an internet service that offers weekly menu plans, complete with recipes and a grocery shopping list!! This is great for the busy mom who has multiple things to do. The site was created by two moms, who understand that often, there just aren’t enough hours in the day for all we have to do! The menu plan choices vary, but you can get a 7-day plan to feed a family of 4-6, or a 5-day two person plan if you want. You can choose a general plan, or one based on a local grocery story if you wish. They also have specialty plan options, such as gluten-free, low-carb, vegetarian etc. etc. 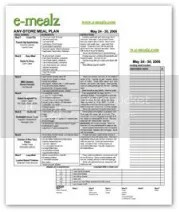 Basically, no matter how you like to eat, E-mealz has a menu plan for you! Each week, a new menu is posted, which you can download and print out. The menu itself is on a grid, with each day’s recipe and ingredients listed. The second page of the menu is your shopping list. It lists all the items you need to buy (staples, like vinegar, ketchup, etc. are listed at the bottom) complete with the price! The best part is, the menu is planned around the sales at the grocery store. I choose the menu plan for Publix, as I live in Florida and that is the place I shop the most. I also saw menu plans for WalMart, Krogers, and a few other places. You can also just pick a general menu that is not tied to a specific store. My weekly menus ran about $80.00 per week. I will say that not EVERY item on the list was the exact price listed on the menu, and I know some of the other crew members found the same thing, but I think that is just because food prices vary from region to region. For the most part, the dinners were inexpensive, and didn’t run me any higher than my usual grocery budget. The weekly menu usually consisted of some type of crock pot or slow cooker meal, a vegetarian option or two, and some sandwiches as well. I found the recipes could be easily adapted. We are not vegetarian, but it wasn’t difficult for me to add some meat to the dishes on the menu. I didn’t make every meal on the list, because there were some I knew my family wouldn’t like (i.e. Cheesy Tuna Cakes…we’re not big tuna eaters here), but I will say, even if I only made about 4 of the meals, I still feel the service was worth it! Some days are just so busy, I don’t want to have to think about dinner, and E-mealz kind of gave me a “go-to” list of dishes that didn’t require a lot of time and effort! I think our favorite meal was the beans and rice. We eat a lot of beans/rice/Spanish food in our house, and this recipe was tasty!! I did add chicken to it (I just added the meat from the rotisserie chicken I had gotten from Publix for a meal we had the night before), but it was easily done. It was served with a tomato and cucumber salad that my kids just loved!! (Who knew I could get them to eat cucumber? 🙂 ) This is a picture of the meal that my son took! We also enjoyed the turkey-pineapple sandwiches (another combination I never would have thought of! ), the wild rice and chicken, the potato soup, and many other dishes as well. **Disclaimer: I was given a free subscription to this website for the purpose of writing this review. All opinions expressed are my own. It has been a crazy couple of weeks for my family! We found out (suddenly) that we were going to have to move!! Talk about panic! Fortunately, God blessed us and we were able to get right into a great new house. What followed is a blur…boxes…bubble wrap..tape…I vaguely remember wrapping my nana’s china and my son’s lego creations. I know this will pass, and things will get back to normal, but right now, I feel like I am going crazy!! At least we have internet again! We’re all happy about that!